I can't believe Christmas is over and I didn't have a proper Christmas Day post. I didn't even make or bake any special treats for my friends except the panettone bread pudding which I brought to work. I haven't even opened my presents- I don't know why. Of course I know why! I'm busy and I'm lazy and I'm tired and I'm waiting for something maybe. I made the cake for Claudia on her birthday. It is a tall four-layer angel food cake flavored with almond and pure vanilla; filled with luscious homemade custard and then frosted with dark chocolate ganache. Originally, the base is sponge cake inspired by the popular Boston Cream Cake of Omni Parker House which was featured on Food Network's The Thing I Ever Ate. I made my version using angel food cake and for some reason I just thought I'd surprise C with the same cake on her birthday. She was touched I'm sure- and happy and that's great but then it's like history repeating itself over and over again. I did not give justice to the cake with better pictures. It's even harder when I don't have good lighting in the kitchen as I made it late in the night. 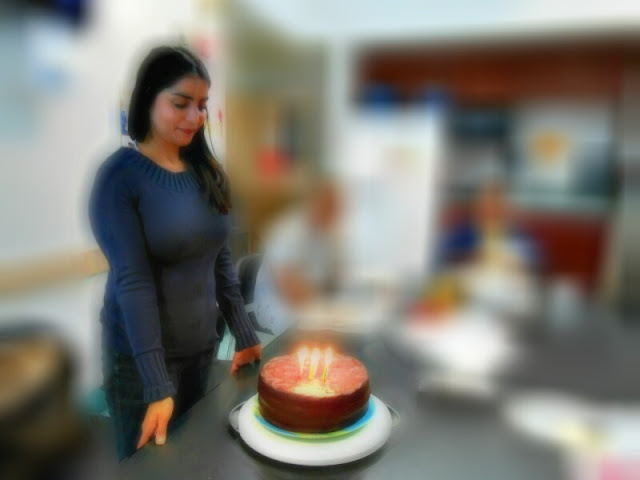 But disregard the pictures or lack thereof and I know I made an awesome cake to please the birthday celebrant and my friends at work. 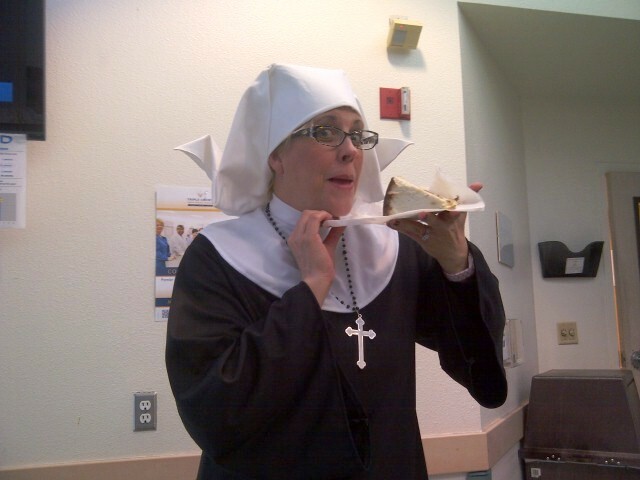 The cake disappeared fast and this is Ms. JC b (below) in her Halloween nun's habit with the last slice which we saved for Teresa. Unfortunately (for her) she forgot her container in the fridge despite my numerous reminders (the last one just a few ticks before she left) and I did warn her that if she forgets, then I will conclude that she doesn't want it and I'd give it to someone else who does; to which she replied she will come back for it no matter what. And she did forget so Ms JC took the container out and posed with the cake in hand and I took pictures which I sent to Teresa to teach her a lesson. Hmmph my cake felt so unloved and she had no clue what she missed. And then the phone rang- it was Teresa! She said she'll come back for the cake and I told her it's gone but didn't she put her daughter on the phone and somehow, I was suckered/trapped into a telephone pinkie swear to make a whole one for the kid instead of teaching the mom a lesson. After all, the kid is a fan according to mom and who can refuse a kid? Anyway, I did make it for her birthday two weeks ago. I'm easy like that but hey, I was happy too. I was so inspired when I made this for dinner. I have a big bowl of fresh seafood (clams, mussels, squid and shrimp) although I lacked a very important component which is fish. I didn't have time to get any. With a loaf of crusty Italian bread on stand-by, I was looking forward to a hearty and delicious soup. But the dining area light is just so bad. The light bulbs couldn't choose a better time to get busted and we didn't have the proper replacement on hand. So I have three creations which I failed to document properly but the execution and results were great. 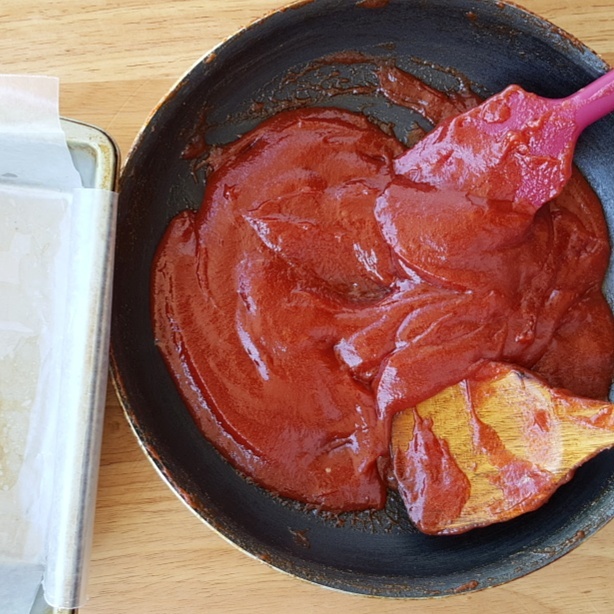 I guess I can live with that and just recreate Black Paella, Boston Cream Angel Food Cake and Cioppino with better pictures.